The time has come around for yet another birthday celebration, this time for cornetist Dominic James LaRocca, born on April 11, 1889. Nick LaRocca was born in New Orleans to a poor Sicilian family. He was exposed to the brass bands there while growing up, and was inspired to take up the cornet. Working at first as an electrician, Nick became a full time musician in the early 1910s, playing with Papa Jack Laine. In 1916, he became a member of the Original Dixieland ‘Jass’ (later “Jazz”) Band, of which he assumed leadership, and played on their 1917 recording of “Livery Stable Blues”, often credited as the first jazz record. The famous “Tiger Rag” was credited to LaRocca (who held the copyright for it), though it was a traditional New Orleans tune that existed for many years before the Original Dixieland Jazz Band recorded it. LaRocca toured around the world with the ODJB, until he had a nervous breakdown in the early 1920s, and returned to New Orleans. After recovering from his ordeal, the band got back together in the mid-1930s for a successful reunion, at which point they made several more records for Victor, their first electrical recordings. Late in life, he wrote a series of letters claiming to be the sole inventor of jazz (a claim also famously made by Jelly Roll Morton, who actually had for more credibility behind it than LaRocca). LaRocca died in 1961. Victor 18717 was recorded December 1 and 4, 1920 in New York City. The Original Dixieland Jazz Band consists of Nick LaRocca on cornet, Eddie Edwards on trombone, Larry Shields on clarinet, Benny Krueger on alto saxophone, J. Russel Robinson on piano, and Tony Sbarbaro on drums. First up, a medley of “Margie”, interpolating “Singin’ the Blues”. 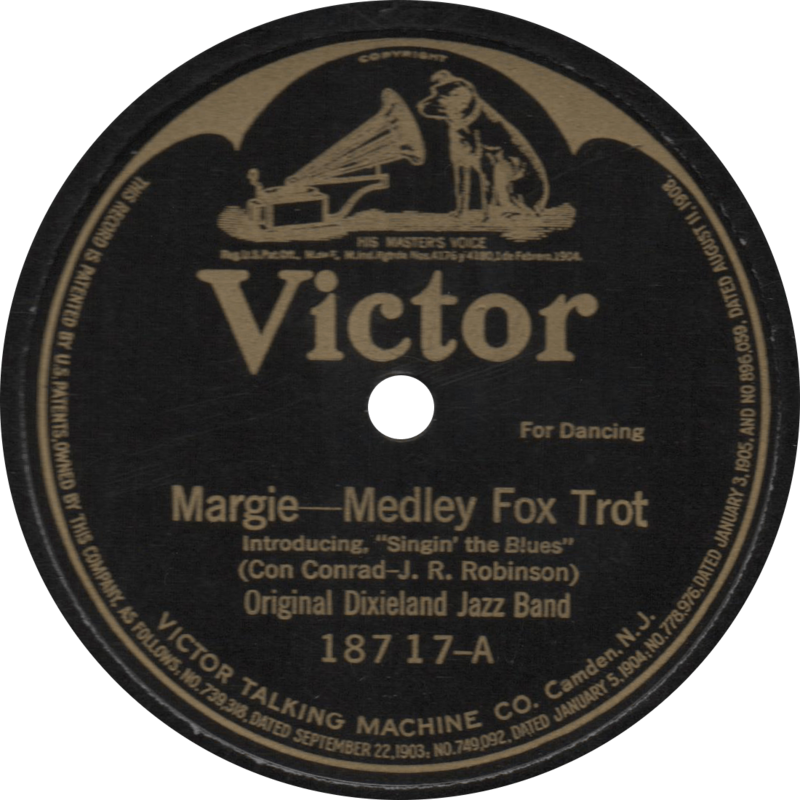 Margie, recorded December 1, 1920 by the Original Dixieland Jazz Band. On the flip, another solid tune, maybe better than the first, maybe not: (Lena is the Queen of ) “Palesteena”. 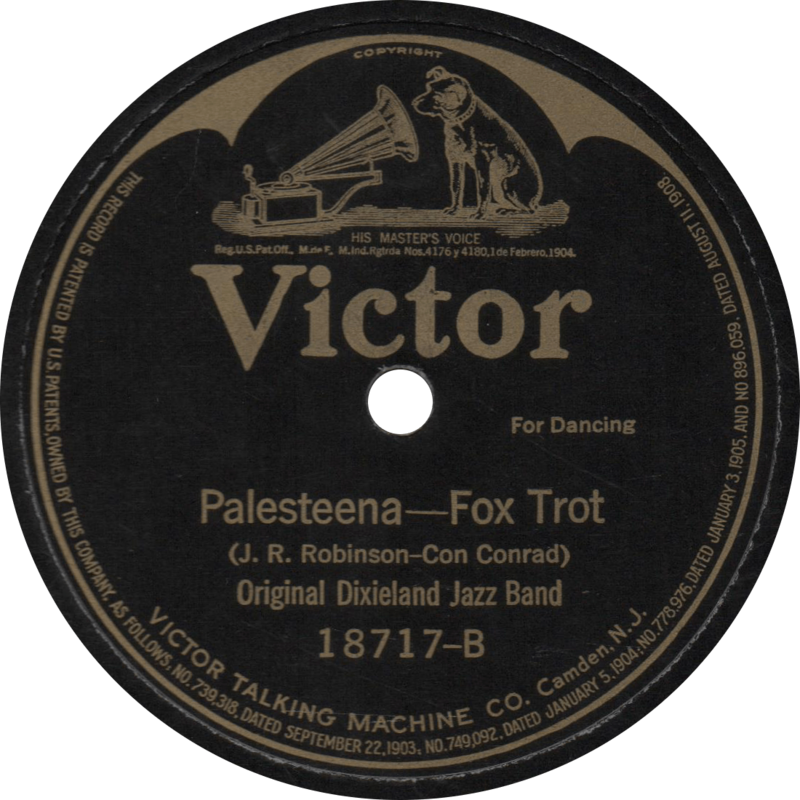 Palesteena, recorded December 4, 1920 by the Original Dixieland Jazz Band. This entry was posted in Records and tagged 1920, 1920s, Benny Krueger, Eddie Edwards, J. Russel Robinson, Jazz, Larry Shields, New York, Nick LaRocca, Original Dixieland Jazz Band, Tony Sbarbaro, Victor by R. Connor Montgomery. Bookmark the permalink.